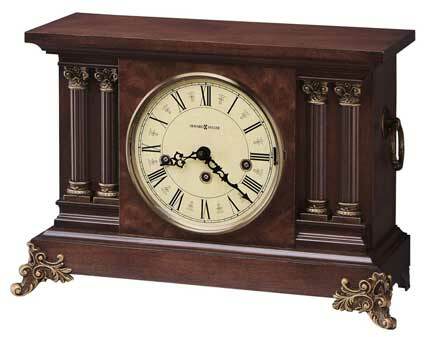 The Howard Miller Circa 630-212 Mantel Clock is an antique-styled mantel clock featuring a lightly distressed finish and is rich in reproduction hardware giving it a very authentic look. Decorative reeded columns frame the dial, and reproduction hardware adds a distinctive touch to the capitals, column bases, decorative rings, and front and rear feet. A Carpathian elm burl veneer creates an additional point of interest. Aged to match the era, the dial features Roman numeral graphics. Magnetic catch on the hinged bezel will never wear out. Finished in Americana Cherry. German made Kieninger Key-wound Westminster chime movement requires winding only once per week. Chime on/off lever and durable bronze bushings. Clocks for sale at The Clock Depot including the 630-212 at discount prices.